No matter the size, every audiovisual (AV) project has a budget, and it can be tempting to cut corners to save some cash. Cutting out an AV systems integrator, however, can cost you more money in the long run. There are plenty of reasons people choose not to use an AV integrator, but those reasons might be rooted in more fiction than fact. Here are some common myths about AV integrators debunked. Fact: AV systems integrators are experts who can work within whatever budget you have, as long as you get them involved soon enough. Engaging an AV integrator early in the process can even help you avoid incurring unnecessary costs in the long run. But, if you bring in your integrator too late, your project can end up being more expensive than it had to be. For example, if you bring an AV integrator in when your building is almost done, they could discover your meeting spaces are not wired properly for the AV solutions you need, and you have to spend extra money rewiring the room. On the other hand, if you had engaged an integrator at the beginning of your project, the room would have been designed and wired properly in the first place. Talking with an AV integrator early on can also help you avoid investing in an expensive system that won’t ultimately meet your needs. Fact: Installing an integrated AV system takes more than choosing a bunch of tools you like and plugging them in. You need tools that will work together as a whole, and be intuitive and easy for anyone in your organization to use. "Many companies underestimate the amount of work that goes into every project. They may see the final product and assume that they can have that too, with little foresight or planning. The truth is, most AV integration projects are highly involved from the very start," says Robby Turner, Executive Vice President, Sales and Marketing at PSNI affiliate Data Projections. Without an integrator, your risks include making too small of an investment or choosing the wrong type of hardware, and ending up with a system that doesn't meet your needs. As technologies such as artificial intelligence, virtual reality, and automated workflows develop and become more commonplace, it will become more and more important to partner with an integration expert who understands technology trends and quality standards. 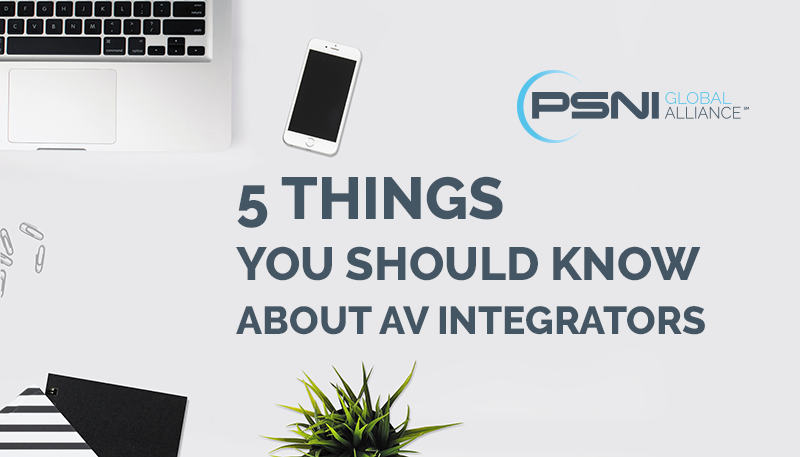 Fact: AV integrators saw the convergence of AV and IT coming from a mile away and have been preparing for it ever since, so now that it’s actually here they know just what to do. Many AV systems integrators are qualified to talk about IT infrastructure. And every integrator has access to additional experts, including manufacturers that make networked AV equipment, other integrators—as well as your IT team—to understand and address all your network needs and concerns. Fact: AV integrators work across all industries and want to understand your business goals and objectives. A good integrator will start by asking what technology you are currently using, what you like and dislike about it, and what problems you are hoping to solve with a new or updated solution. Integrators will work to understand how you plan to use the space, who will use your system, and how many people need to be trained to operate it. They will ask about your budget, and make sure you understand the value they will bring to your project. If the first thing an integrator does is start pitching products, that is not the right integrator to work with. Fact: PSNI’s worldwide alliance of AV integrators turns even small, local integrators into large, global support providers. Any integrator in the PSNI network can leverage the experience and expertise of any other affiliate, which means you can get the proactive, hands-on, informed support you need, no matter how big your company is or where you’re located. Whatever the size of your company or the size of your project, an AV integrator is the right kind of expert to get you the solution you need at the price you want. Contact your local AV systems integrator today.